To help you assess the potential of your loft space we are happy to meet with you to discuss your requirements and carry out a free loft conversions survey - which will provide the basis for our fixed price, no hidden extras, quote to you. The first thing to decide when considering a loft conversion is what sort of loft conversion do you want? What will you use the extra space for? It could be simple storage, or a bathroom or shower cubicle. Alternatively you may want a studio for painting, photography etc., a dark room, an office, play room or extra bedroom(s) with or without en suite. There are many possibilities. You need to know what you will want to use the additional space for to come up with the right design. We offer a free, fully detailed all inclusive quote in the post to you within 7 days. In order to comply with Building Regulations, the loft has to be a minimum of 2.3m or 7'6" at its highest point. Those measurements are taken from the top surface of the ceiling boards below, to the felt at the very apex of the roof. With that in mind, we can make the most of even the smallest lofts with the imaginative use of dormer windows and staircase positioning. Planning permission is only required if you wish to put a dormer window on the front of your house and your house is within 26 metres of the road, or if the house has been substantially extended in the past. We will deal with all aspects of the planning application to ease your way through the process. Again, we are used to dealing with Building Control at local Councils, and we will complete all necessary paperwork for you. The cost is usually £300 - £500, and will be included in your quote. 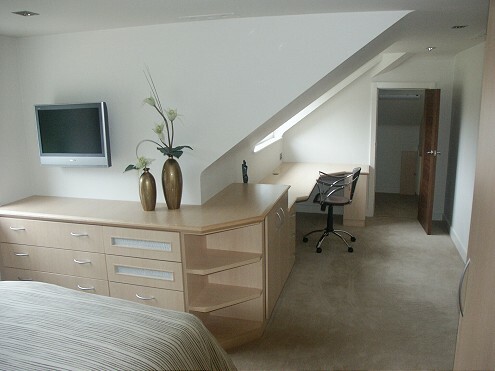 Our loft conversions will make the best of that under utilised space.